The legality of pit bull ownership is a fiery debate across the country. According to the city council of Topeka, Kansas, a dangerous dog is any that behaves in an aggressive manner and biting is not a necessary condition. Numerous cases of pit bull attacks and illegal dog fighting have caused states to outlaw or restrict ownership of these animals. According to Michigan State University College of Law, since 2000, 38 states have passed laws restricting or banning pit bull ownership. Restrictions and bans in Kansas have been placed at the state and local level. Breed Specific Legislation in Kansas has caused much controversy and debate. The state of Kansas has a "dangerous dog" law that outlaws any dog that is a danger to the public. However, it does not specify a particular breed as "dangerous." Although state law does not single out pit bulls as dangerous dogs, many municipal laws and ordinances within the state ban the ownership, harboring or keeping of pit bulls within city limits. According to America against BSL, 35 cities and townships in Kansas have adopted BSL legislation, including Topeka, Park City, Salina, Ulyssess, Overland Park and Kansas City. There are few exemptions for having these dogs within city limits. According to Topeka ordinance, owners are allowed to transport pit bull dogs through the city if adequate measures are taken to keep the public safe. Violators can be fined up to $499 and sentenced to a jail term of up to 179 days. 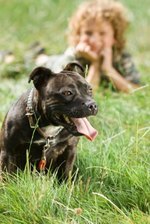 Wichita, Kansas, adopted BSL in 2009 that restricted pit bulls. Pit bull owners must have their animals microchipped. Implanted microchips allow authorities to locate the owner if the dog becomes a stray. In addition, all pit bulls must be sterilized. Owners who have a valid breeders licence are exempt from sterilization mandates. Since 2009, Wichita has limited pit bull ownership to two per household. The only exemption is for owners who have a breeders license or a valid animal maintenance permit.